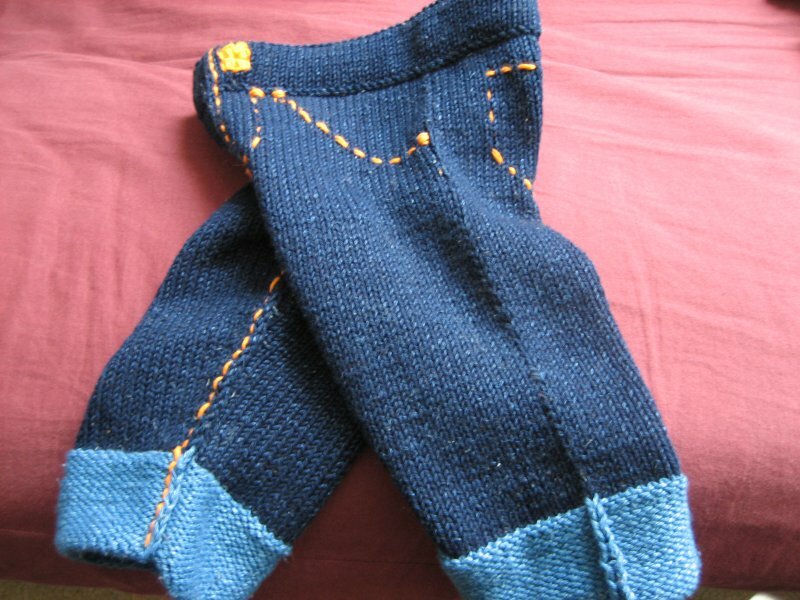 The Knitting Pirate » In Which the Pirate Could Not Have Done It Alone. « In Which the Pirate Re-Embroiders. In Which the Pirate Could Not Have Done It Alone. Before anything else, I need to thank Pirate-Husband, who saved me from a hell of unseamed babypants. 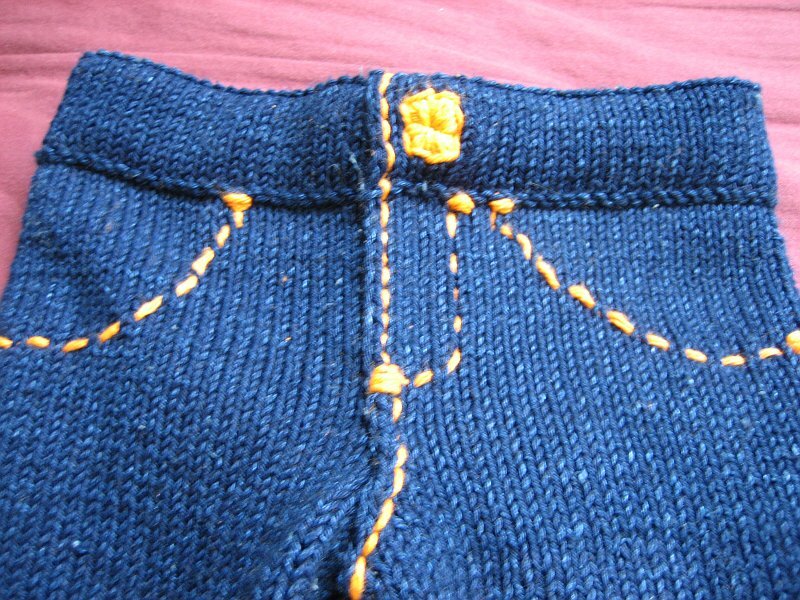 On Tuesday, after the nightmare of waistband stitches getting free, I tried to get the seams in and failed. On Tuesday night, Pirate-Husband gave it a try, but was also frustrated. Wednesday, I made four attempts to seam the pants, four different techniques, and still failed. (Oh, I could seam them all right. But the seam wasn't showing. How odd.) Wednesday afternoon, Pirate-Husband came home from work and announced, "I know how to do this seam." And he did. It was amazing. I am eternally grateful. So! The pants are done! The baby can be born now! I almost regret making them the larger size, because I'm going to have to wait so long to see them on my niece. They are the 12-18 month size, so it may be a while. I know that some babies are wearing 12 month sized clothing at 9 months old, but my sister-in-law is only 4'8" and the baby could be on the small side. The technique of a turning ridge was a new one for me in this project. I really like it! Well, with the exception of the live stitches coming off the waste yarn in the wash - but that was probably my fault. The ridge makes it so easy to get the fold in the right place. It's a good thing I enjoy handsewing, because the next step was to very carefully take the stitches off the waste yarn and sew them down to the inside of the garter ridge. It's nice and flat, and you can't see any of the stitches from the outside. These pants are the cutest thing ever. I can't wait to see my sister-in-law's face when she opens the gift. She has been saying that she doesn't like too much pink, or cutesy, or ruffles, or anything that standard baby girl clothing seems to be. 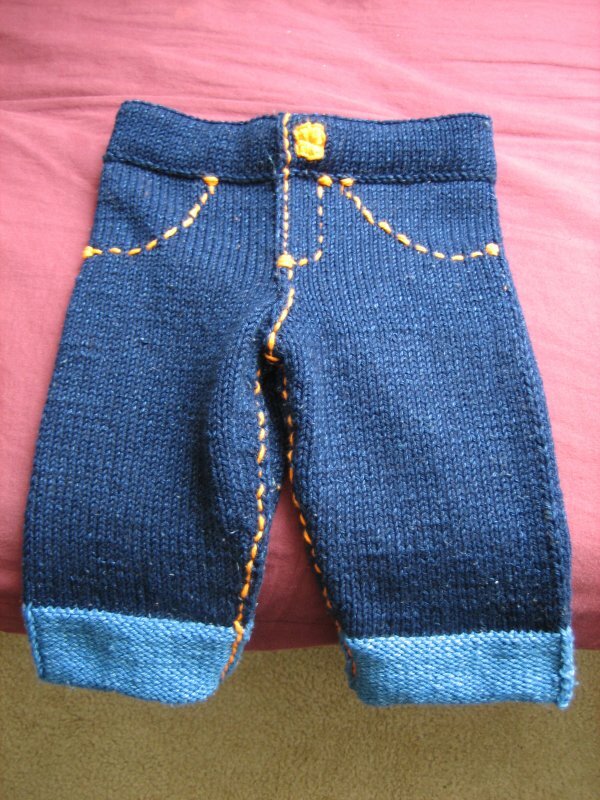 Baby jeans are perfect. I'm so excited! I'm going to be Aunt Pirate! This entry was posted on Thursday, May 17th, 2007 at 13:22 and is filed under babyclothes, blu. You can follow any responses to this entry through the RSS 2.0 feed. Both comments and pings are currently closed. I LOVE the pants!!! I've been hearing and hearing about these and envisioned those short poofy things they stick under dress or the standard two rectangles joined in the center. These are just in a league all their own. Now I want to make a pair ...gotta find a niece. Well done! I really can't take that much credit. She made them, I just put it together. What Pirate failed to mention is that she was just overthinking the whole seaming process. 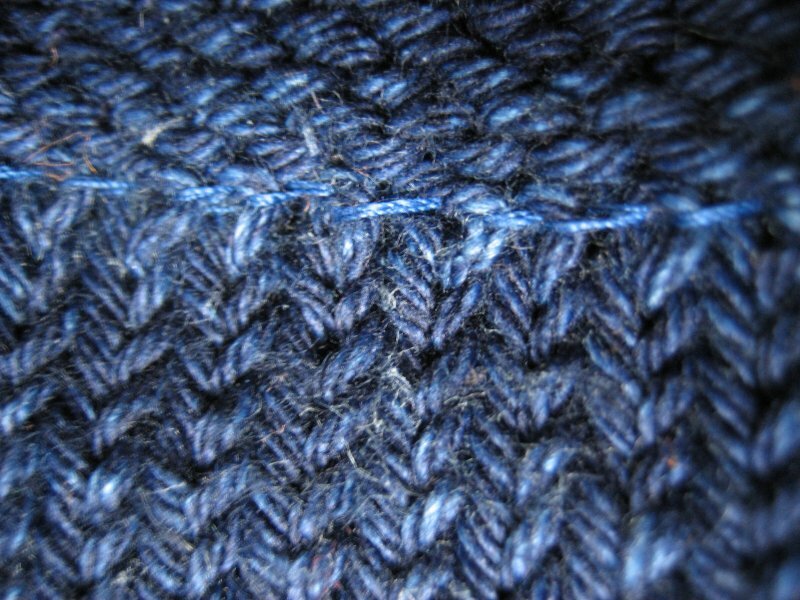 The finished seam mimics a box seam on jeans, but you don't actually fold them over in a box because the yarn is so thick. She kept trying to make it more complicated then it actually is. The pants really are adorable, and I can't wait to see my new niece in them once she decides to show up! Now that I've admitted that I have to go keelhaul someone and regain my manhood... Yar! Pirate Husband need not be so modest. A little vision can go a long way..much to be said for teamwork!